Barry Callebaut has been going through some chimneys to find the best of the Christmas 2017 magic for you! Enjoy our confectionery seasonal launches review. It’s that time of the year! When Christmas is all around you, confectionery aisles and counters experience a magical makeover. Find out the many exciting ways that chocolate makers were bringing that special spark to their offer during Christmas 2017. 2017 brought us an explosion of advent calendars, which are now among the trendiest and most sought-after Christmas treats. To compete with all the exciting options from tea, alcohol, beauty and so on, confectionery players have been stepping up their game too. Not only did they get creative with the packaging, but also each of the 24 little delights inside are delicious pieces of art. 2 luscious bonbons in each window from Hotel Chocolat. Share and spread the love! 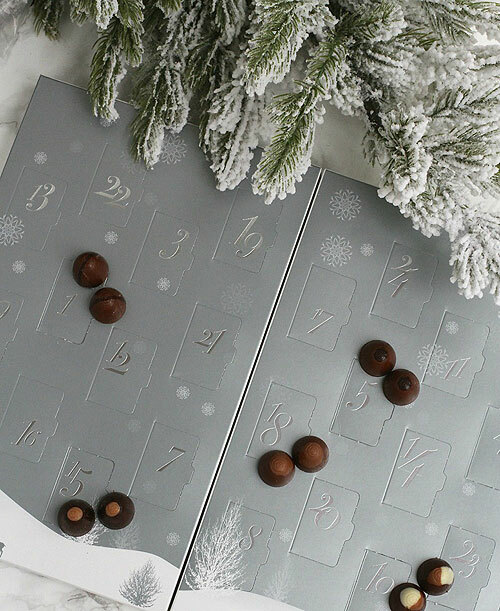 As if the countdown excitement wasn’t enough, there are more and more playful creations out there so that you can share some joy with family or friends while indulging in the best-tasting chocolate. Christmas Piñatas are a great alternative to traditional desserts combining the fun of breaking it up with the surprise of discovering the delicious treasures hidden inside. If you are in a more constructive mood you can choose to build your own Christmas dessert! It can be a cute chocolate deer that comes in disconnected pieces for you to bring together, or a Christmas tree with its crunchy, crispy, chewy - you name it - but invariably delicious decorations. Left - Luxury ‘LEGO’ by Alain Ducasse; Right - Meert and their mouthwatering Christmas tree mendiant style. Luxury baubles with too-beautiful-to-eat insides by Lakrids, Denmark. 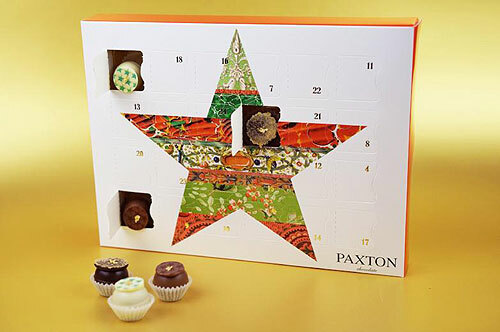 As to flavors, next to the all-time classics of orange, champagne and (salted) caramel, more and more winter desserts and drinks are finding their way into the Christmas bonbons and tablets: think gingerbread, mulled wine, apple strudel, pannetone, chai latte, and many more. Focusing on the visual, the green-red-white combination evokes the cosy and warm feelings and makes a perfect gift. Or the Christmas tree with its lovely pine cones are always a winning way to stand out during the winter months. White chocolate with cranberry & pistachios - Christmas tricolore by our chef Sarah Hartnett. Snow-dusted chocolate delights from the winter forest by M&S, UK.